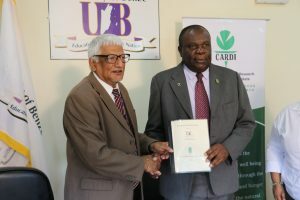 The Caribbean Agricultural Research and Development Institute (CARDI) and the University of Belize (UoB) have signed a Memorandum of Understanding (MoU) to collaborate in the areas of knowledge sharing, training and capacity building, resource mobilisation and research geared towards the development Belize’s food and agricultural sectors. The MoU was signed by CARDI’s Executive Director, Barton Clarke and the President of the University of Belize, Professor Clement Sankat at the University’s, Main Campus in Belmopan on 19 July, 2017. Present at the signing were CARDI Representative to Belize, Omaira Avila Rostant and UoB, Central Farm Campus Administrator, Gordon Holder. Following the signing Professor Sankat elaborated on the MoU saying that it will facilitate staff exchanges between the Institutions and give CARDI staff the opportunity to deliver training programmes at the certificate and associate diploma levels at it’s Central Farm Campus. Barton Clarke said that while this MoU is beneficial to both parties, he is particularly pleased with the education and training opportunities available for mentoring and developing young talent. He said that this is crucial for the development of a modernised, competitive agricultural sector across the Region.